Whether early childhood experts like it or not, we will be forced to continue to assess preschool children. As I mentioned in the last entry, I think it is appropriate that we are accountable for helping children with school readiness skills prior to entering kindergarten. One of the hindrances in assessing preschool children has always been the fact that many early childhood educators are poorly paid and poorly prepared educationally to create effective and authentic assessment tools. As long as early childhood programs continue to have low wages, teachers without educational degrees will be filling the positions. This leads to a lack of expertise when it comes to evaluating the progress of individual children. When this happens, assessments that are not developmentally appropriately administered creep into the system. In this day of fairly homogeneous early childhood performance standards, the appropriateness of an evaluation is not in what is evaluated, but how the evaluation occurs within the early childhood setting. I believe that the beginning of a good preschool assessment system begins with good assessment tools. Using these tools in a developmentally appropriate way is what makes the assessment authentic and accurate. With No Child Left Behind (Leave No Child Untested), there is increasing pressure being placed on preschool programs to prepare children to enter kindergarten. In fact, the current National Head Start Test (NRS) is an excellent example of how government is insisting that preschool programs be accountable for preparing children to enter school. In discussing reauthorization of Head Start, Congress recognized that the NRS is poorly designed and has ordered scientific researchers to analyze the assessment and make it a more effective tool. Unfortunately, Head Start Agencies must continue to administer the poor assessment until it is analyzed and made more appropriate. While I have no problem with being accountable for early childhood services, I am concerned about our ability to place a national standardized assessment on a four year-old child. Early Childhood professionals recognize that to paint an accurate picture of a child’s school preparation, there must be observation, analysis and formal assessments within the classroom environment to authenticate the information. Can a standardized assessment really do that? 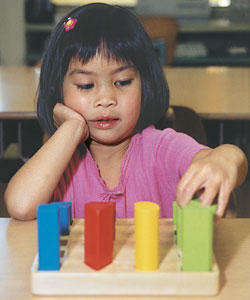 Are we going to be able to develop a system that will give us an accurate picture of the child’s learning? Given the track record of other standardized tests, I am not sure we can create an accurate instrument.